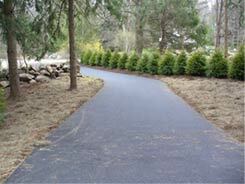 Asphalt patching will prolong the life of your driveway. If your existing driveway is cracking, puddling or coming apart, it is time you met with one of our salesmen. We will assess your pavement and tell you where the problem areas are, what’s causing them and the best and most cost effective way to fix it. 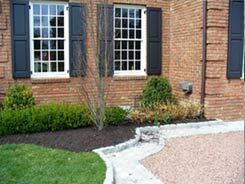 When putting in a new driveway, we will clear the area to be paved. Then with our state of the art laser equipment we will grade the area so there is positive pitch for drainage. Next we will install base material and compact with our high impact compactor insuring no movement under the pavement. Now the area is ready to be paved. With our experienced staff and top of the line paving equipment we will give you a smooth and appealing driveway that will give an instant facelift to your property.